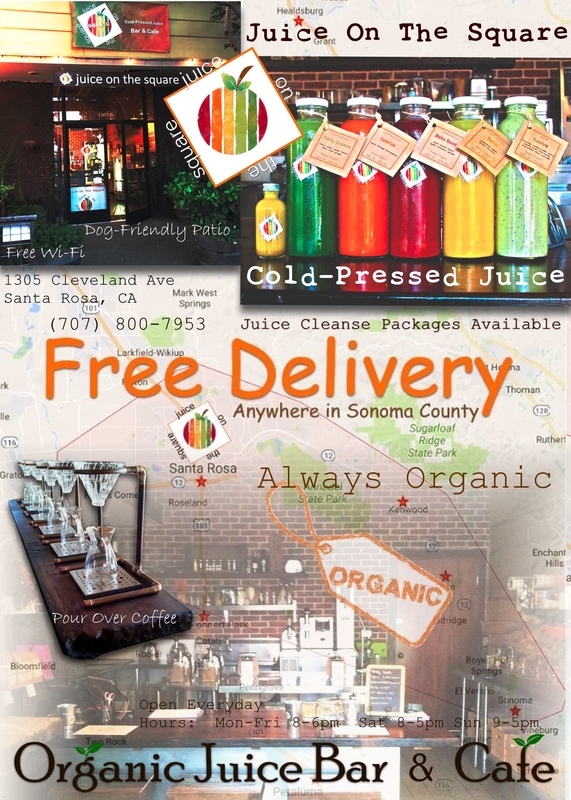 Juice On The Square Organic Cold-Pressed Juice Bar and Internet Cafe is based out of Santa Rosa, CA which also offers free juice delivery service anywhere in Sonoma County. We require 24 hour notice for delivery outside of Santa Rosa. Most deliveries are scheduled before 7:30am or between NOON-1:00PM with some afternoon exceptions. It’s best to call 24-48 hours a head of time so we can prepare all your favorite cold-pressed juices for pick-up or delivery. Click here to view our menu of juices and nut-mylks. Juice Cleanse deliveries are also available.